TEMA Process -Breadcrumb and Rusk processing lines. TEMA Process -Breadcrumb and Rusk processing lines. Breadings typically contain seasonings and are applied as coatings to fried or baked foods to achieve certain textures, colors, and flavors. Rusk is used as a filler or a binding agent in hamburgers and sausages. Breadcrumb is made in either loaves/bricks/sheets or extruded onto a baking belt. 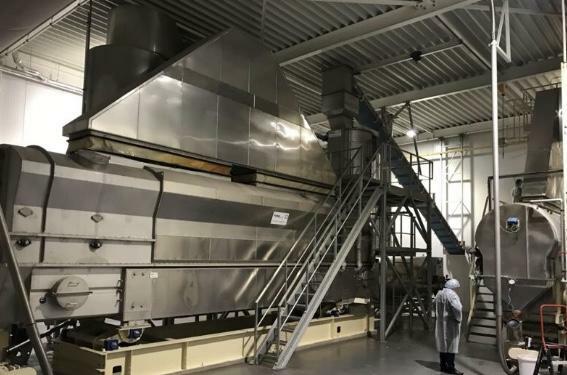 The Tema bread crumb or rusk line consists of a bread mill, a fluid bed dryer/cooler, air supply/recirculation duct system, a gas burner to heat up the air, a cyclone, a cooling fan to cool down the product before the milling/screening and a fully automated control system. The bread crumb production lines are available in a wide range of capacities starting from 500 kg/hr up to 6.000 kg/hr. The PLC controls is an essential part of the system. The controls are used to achieve the right color, shape and texture of the product. The product inlet moisture is often between 35-41% and is dried to 8-15 % and cooled down to <50°C.